Once again the weather is turning colder and as predicted flu season is here again. When you feel under the weather there is little things that can give you the kind of comfort a hot bowl of soup can. When it’s cold outside, and your nose will not stop running, and your voice is raspy, and your whole body aches while your head just will not stop pounding; a bowl of soup is literally like a hug to your soul. That’s why today I am sharing my chicken and tortellini soup, which is one of my go to soups when I am not feeling well. 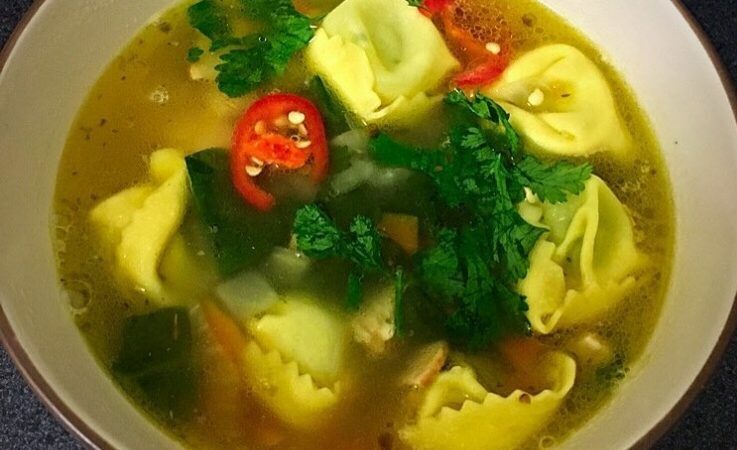 We all know how good chicken soup is for a cold or flu and tortellini? well they are good for your soul. In a large pan heat up some olive oil and brown the chicken on both sides, once that’s done, add water, (enough to cover the chicken and more) and bring it to a boil and let the chicken cook until it starts to fall off the bone. One that’s done drain it and take the chicken off the bone, it doesn’t need to be in even pieces, just pull it of in strips and chunks. Set aside. In a large pan heat up some olive oil and add in your celery and carrots mix and sit until everything is cooked down. Add in your chicken and season with a pinch salt and pepper, chilli flakes and garlic powder. Pour in your boiling water and add in your spinach, next add 1 vegetable stock cube. Stir and let it simmer for about 5-10 minutes. Add in your tortellini and let it cook for about 2 minutes. Garnish with fresh coriander and enjoy hot. Wrap up warm and I will see you in the next post. Or catch up with me on twitter @RominasCorner?